2009's 'G.I. Joe: The Rise Of Cobra' received mixed reviews, although I found its combination of comedy and action to be quite satisfying. Hence, I was one of the minority to actually be looking forward to 'G.I. Joe: Retaliation'. Alarm bells began ringing however when the release date was pushed back by almost a year, even after the film's advertising campaign had begun. My fears have been realised with this tremendously disappointing sequel. The film picks up from the end of 'The Rise Of Cobra', with Zartan (Arnold Vosloo) successfully replacing the US President (Jonathan Pryce), while Destro and Cobra Commander remain imprisoned. Most of the previous cast have been jettisoned, and Joseph Gordon-Levitt as Cobra Commander is sorely missed - replaced by Luke Bracey. 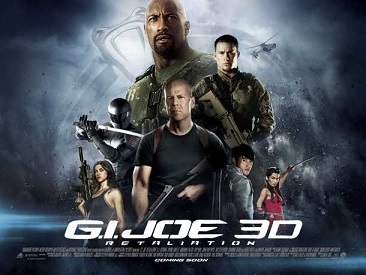 Duke (Channing Tatum) heads up the Joes now, with Roadblock (Dwayne Johnson, aka The Rock) second in command, and the likes of Snake Eyes (Ray Park), Lady Jaye (Adrianne Palicki), and Flint (DJ Cotrona) in tow. Zartan, in his guise of President, soon frames the Joes which justifies his subsequent assassination of the team. A few survive however, determined to battle against Cobra and clear their names. It's not quite as much like 'The A-Team' as it sounds, and arguably unfortunately so. There is something of a charisma vacuum in 'Retaliation', which subsequently leads to any deaths of major characters feeling rather devoid of emotional significance. The faceless villain that is Cobra Commander is also problematic but it is the blandness of the protagonists that most grates. There is some colour to the film however, but again, perhaps not in the intended fashion. Blind Master (RZA) and Firefly (Ray Stevenson) both share utterly distracting mannerisms and accents, with the latter seemingly channelling Vernon Wells's pantomime villain Bennett from 'Commando'. Bruce Willis is on board as the original Joe to add some action hardiness to 'Retaliation' but his addition seems superfluous. Jonathan Pryce's dual role as President/impersonator stands out, as does one cliff-face scene - director Jon M Chu's background is with dance films like 'Step Up 3D', and he captures the almost balletic action sequence impressively. The action elsewhere proves more troublesome however, as Chu's choppy style makes things hard to follow. 'Zombieland' writers Rhett Reese and Paul Wernick are similarly culpable, not fleshing out characters and delivering a shambolic finale. The teenagers emerging from my screening seemed rather disinterested by the whole affair, choosing instead to discuss their excitement of the forthcoming 'Olympus Has Fallen' - for which we'd seen a two minute preview a good two hours before 'G.I. Joe: Retaliation', demonstrating just how sadly forgettable this sequel is. 'G.I. Joe: Retaliation' is in UK cinemas now, through Paramount Pictures.